2nd China-South Asia Exposition and 22nd China Kunming Import and Export Commodities Fair in Kunming China were held concurrently from 6-10 June 2014, which was co-hosted by the Chinese Ministry of Commerce and the Peoples’ Government of Yunnan and other Provinces, while commercial departments of the South Asian countries are invited to join forces in holding the exposition. China-South Asia Exposition is an important platform for China and South Asia to carry forward it’s objective of promoting all-round corporation and development between China and South Asia and also to expand trade and exchange with other countries and other regions, with it’s focused themes of boosting investment – centered cooperation, accelerating inter connectivity and jointly constructing economic corridors and expanding trade in services. FCCISL along with he other organization in Sri Lanka facilitated the Sri Lankan exporters to display their products at the Sri Lankan pavilion in the Kunming China exposition. The 9th China South Asia Business Forum (CSABF) was held concurrently to the Kunming China exposition on June 5-7, 2014, which was jointly sponsored by China Council for the Promotion of International Trade, SAARC Chamber of Commerce and Industry and People’s Government of Yunnan Province. 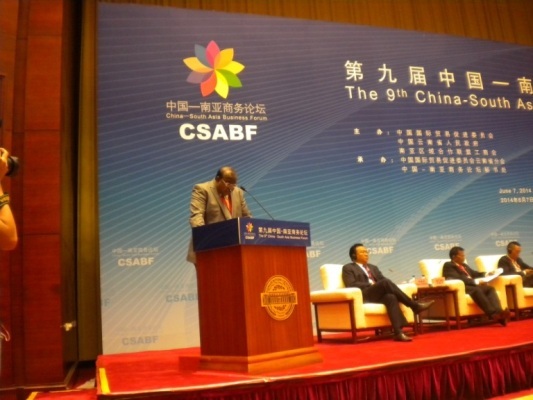 The CSABF aims at building a platform for dialogs and to establish mechanism to promote better cooperation among business circles and councils in China and South Asian countries and for those reasons it has been defined as a brand – name, forum for bilateral cooperation between China and South Asian Business circles. Mr. Ajith Wattuhewa President of the FCCISL, addressed at the Tourism and Services Panel of the Forum. Mr. Wattuhewa in his speech stated that he Government of Sri Lanka in consultation with the private sector launched a Tourism Development Strategy with a holistic approach to it’s growth and as a results of this endeavour In 2013 Sri Lanka had 1.2 Million tourist arrival with the upward earnings of US Dollars1.75 Billion. He further added that by increasing room strength from the existing 30,000 to 50,000 rooms within the next two and a half years and promoting infra-structure development including the beautification of the city of Colombo, and the historic cities of Kandy and Galle targeting 2.5 million visitors to the island by 2016 along with Northern and Eastern Provinces. Mr. Ajith Wattuhewa President – FCCISL, delivers his address.